The name "Dimasa" stands for "children of the big river," referring to the Brahmaputra river. 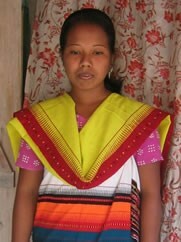 They are one of the oldest inhabitants of the northeastern part of India, and one of the many Kachari tribes. Dimasa believe that they are the children of Bangla Raja and the great divine bird Aarikhidima. Among the six ancestral gods, Sibrai is the eldest and the most important and during worship his name is to be uttered first. The traditional village headman is a Khunang, having both executive and judiciary powers. He is assisted by another official called the Dillik, and a third man, the Daulathu. They are farmers, and raise many kinds of crops and produce. Lack of sustained, focused prayer inhibits the advance of the Lord's kingdom throughout South Asia. There are powerful spiritual forces that resist the gospel, and these are overcome by prayer. The New Testament is available in the Dimasa language, as well as resources such as recordings and films. Please pray for workers to carry these resources to the people who can help them understand the gospel. 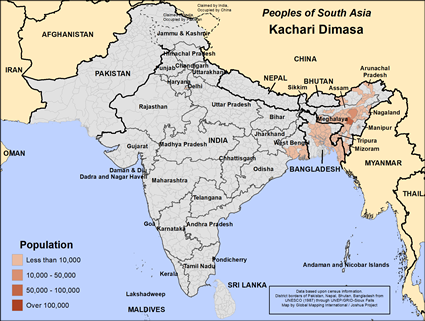 There are no reported Christians among the Dimasa of Bangladesh, but there are reported Christians within this people group in India. Please pray for spiritual maturity for these Christians, and for an increase in their numbers. Please pray the Lord will grant spiritual understanding to all the people groups of Bangladesh. Pray he will reveal Jesus in powerful and convincing ways, and will grant people faith to believe. View Kachari Dimasa in all countries.